This article presents a pendant discovered during the archaeological excavations at a site named “Street“, situated to the south of the Bishop’s Residence. The pendant is made from bronze with high content of zinc, which gives the artifact a golden color. The pendant has two faces. It is a round plate with a diameter of 19 mm thickness of 1 mm. The two sides of the plate have a pearl ring in a high relief on the edge. Two pairs of opposite rings were together with the round pen­dant. The rings are part of the hinge by which the pendant attaches to other plates. Together with the hinges, the maximum width is 27 mm and the maximum weight is 4.01 g.
The Crucifixion of Jesus in relief is represented on the obverse of the pendant. The head is depicted en face, the eyes are large and the beard is long. A halo is schematically marked by short strokes on both sides of the head. The arms are spread horizontally, and the palms are disproportionately large in relation to the body. 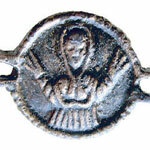 The Virgin with a head covered with a maphorion is represented on the reverse. Her arms are bent at the elbows and raised in a prayer – Oranta pose. Her palms are enlarged, similarly to these of the figure on the ob­verse, and have three fingers. The representations are schematic and roughly made, with unnaturally enlarged details. An encolpion cross, a small bell and an appliqué were discovered together with the pendant. Together with the pendant, they are dated back to the late 10th – early 11th century.